Elizabeth A. Dooley, Ed.D., serves as the University of Central Florida’s provost and vice president for Academic Affairs. As UCF’s chief academic officer, she implements UCF’s vision for being a defining university in 21st-century higher education for teaching, research, service, partnership and student success. She leads UCF’s efforts in becoming a preeminent metropolitan research of global impact, and she ensures that UCF’s academic programs are leading-edge in meeting the needs of students and employers. 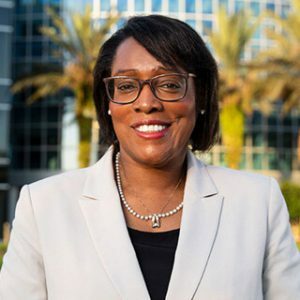 She also directs UCF’s efforts to fulfill its Collective Impact Strategic Plan, and that UCF’s academic practices and hiring initiatives are aligned with the university’s strong commitment to diversity and inclusion. As the face of the faculty and the champion of the student experience, she holds the fundamental belief that education has the power to lift lives and livelihoods. A cornerstone of her academic vision is the commitment to ensuring access for talented students from every background. Dr. Dooley leads UCF’s academic programs and initiatives across the university’s 13 colleges, which serve more than 68,000 students and support more than 3,000 teaching and research faculty. In addition, she oversees multiple campuses, research centers, and institutes within the university. She also manages UCF’s operating budget. Working closely with deans, department chairs, faculty and other academic leaders, Dr. Dooley’s responsibilities also entail faculty excellence, recruitment, advancement and retention along with student success initiatives. Dr. Dooley oversees the Provost’s Council, co-chairs the university Budget Committee, chairs the Dean’s Council, and serves on the Council of Academic Vice Presidents for the Florida Board of Governors. Prior to becoming provost in October 2018, Dr. Dooley served as UCF’s interim provost, vice provost for the Division of Teaching and Learning and dean of the College of Undergraduate Studies. She joined UCF in 2015 after a distinguished 25-year career in teaching, research and leadership at West Virginia University. Her administrative appointments at WVU included associate provost for Undergraduate Academic Affairs, founding dean of the University College, and interim dean of the College of Education and Human Services. She is a renowned scholar and has published extensively on a number of issues related to education and leadership, including learning disabilities, underserved populations with special needs, adult learning and increasing the number of ethnically diverse faculty in special education. Dr. Dooley holds a doctorate and a master’s degree from WVU, and a bachelor’s degree from Alderson Broaddus College.